Windows 8 Language Translator app is available under the ‘Productivity’ section of Windows 8 app store. Powered by Microsoft Translator, this language translator Windows 8 app lets you translate text or phrase in one language to a desired language. The app comes with a wide range of languages including Arabic, Chinese, Czech, Danish, Dutch, English, French, German, Greek, Hebrew, Hindi, Italian, Korean, Persian, Thai, and many more. The most interesting thing about this language translator app for Windows 8 is its audio feature. Well, yes.. you can also listen to your translations in various languages by using the audio icon given in the app. You can also swap between the selected languages and get the translations, instantly and accurately. You can easily translate phrases, or big paragraphs. It’s a very easy to translate. All you need to do is just launch the app ? select a source language ? select a language to which you want to translate ? and finally click on ‘Translate’ button to get the results, instantly. To hear your translations, click on the audio button given at the bottom side. In addition, the app lets you copy the translated text and use it in other application, in your article, or anywhere. You can easily cope the text from a source and paste it for translation, here in this app. Also, you can use the Windows 8’s Search charm in other application and quickly send the text, you want to translate, to this ‘Language Translator’ app to get the results, immediately. 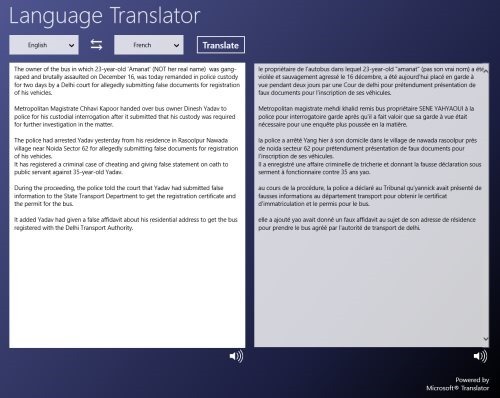 This Windows 8 language translator app provides you the most powerful and easy to use translation experience, right at your Windows 8 screen. Let me point out the main features of this Windows 8 language translator app below. Lets you translate phrases, or any text from one language to another. Comes with a wide range of languages Arabic, Chinese, Czech, Danish, Dutch, English, French, German, Greek, Hebrew, Hindi, Italian, Korean, Persian, Thai, and many more. Lets you listen to your translations in various languages. Lets you copy you translations and use it in other applications. Lets you swap between the selected languages. It’s very easy to translate text using this app. Well.. I really liked language translator Windows 8 app where you can quickly translate between two or more languages, listen to the audio of your translation, swap between the selected languages, just everything you would expect from an advanced language translator. I would definitely go with this one..!! Also, check out our posts on Language Translator Apps, Oprah Winfrey App, and Lyrics Apps. You need to open the given link in IE10 only. Proceed with further downloading in order to get the app now. You are done.. start translating the desired text. In short, Language Translator is a good utility Windows 8 app to perform translations between two or more languages, from within the app. Go ahead and download Language Translator app in Windows 8 now.